If only Hong Kong were still a colony – I’m feeling a sad lack of jubilee fun in my life at the moment. The last two years seem to have brought about more public affection for the royals, and I strongly suspect this is linked to the fact that they have been providing extra bank holidays. And I’ve missed out on it two years in a row! It is my understanding that royal celebrations such as these call for baked goods, booze and bunting, and I woke up on Monday morning with an uncontrollable urge to bake, presumably to satisfy my feelings of patriotism. 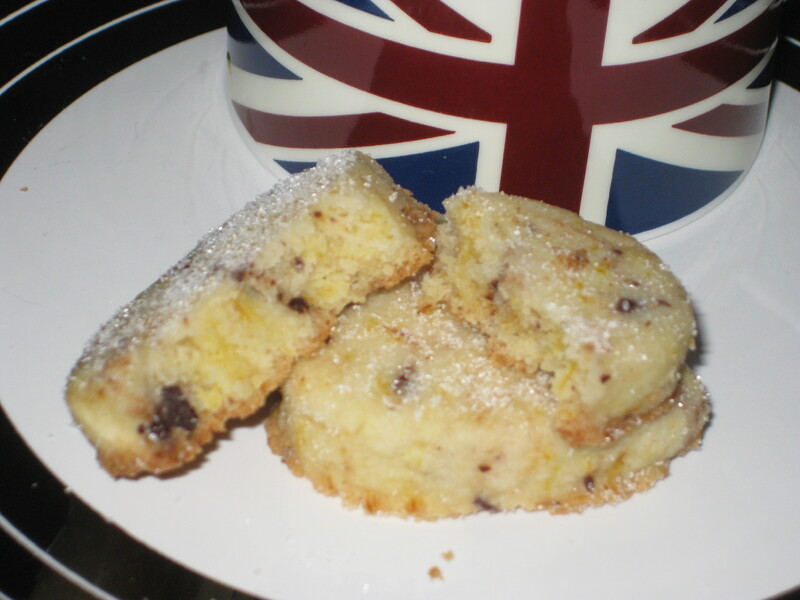 So I produced some shortbread fit for the queen! 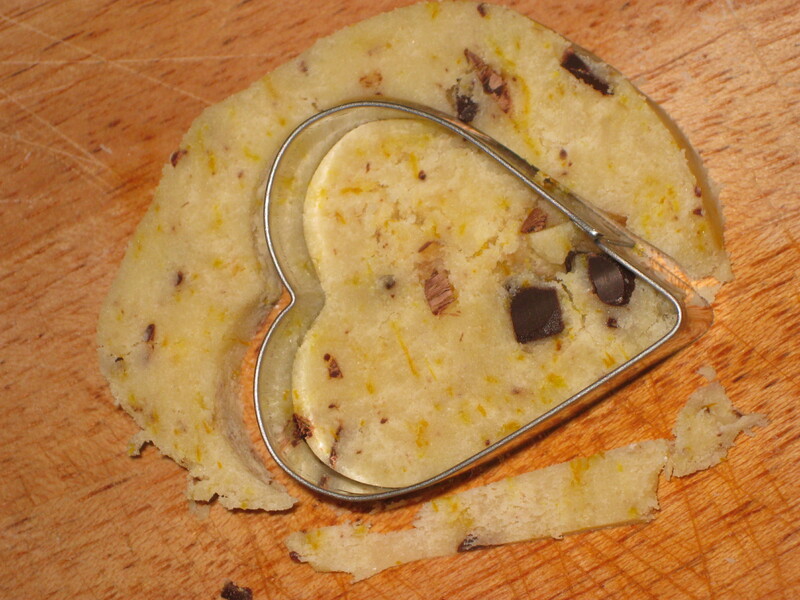 I am a massive fan of Chocolate Oranges, so tried to recapture them in biscuit form. 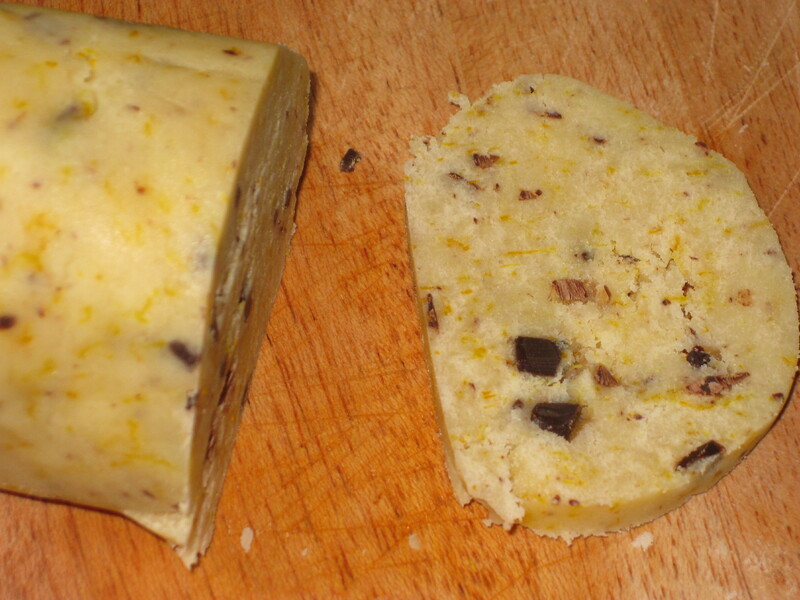 The orange zest is really refreshing, and the chocolate chunks are delicious. 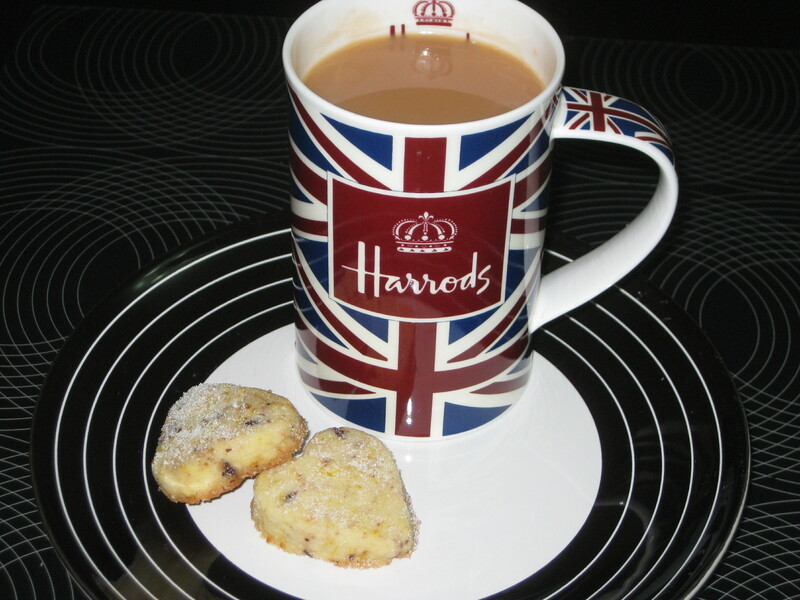 The shortbread itself is crumbly and sweet. 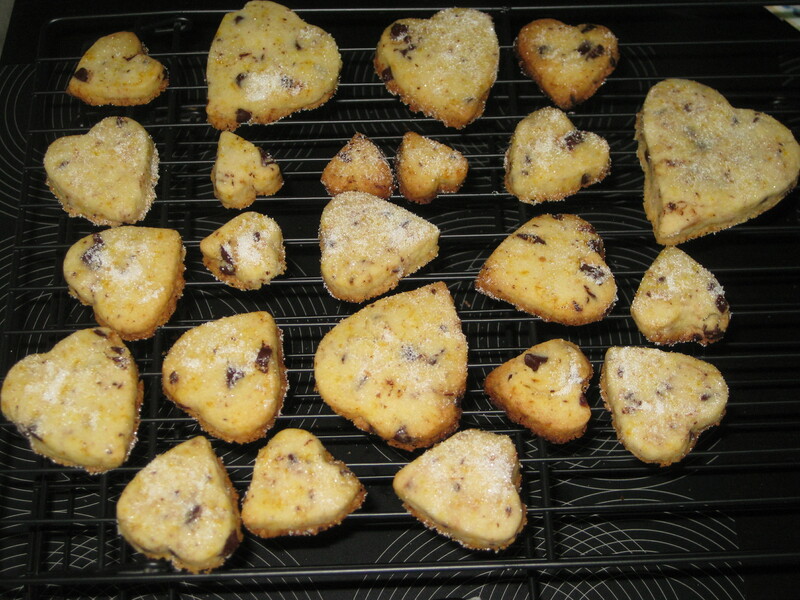 As I cut them into all different sizes too they are quite nice just to peck at, and it’s rather a treat to just have a mini-heart shortbread to make a normal, non-bank holiday cup of tea a bit more special. 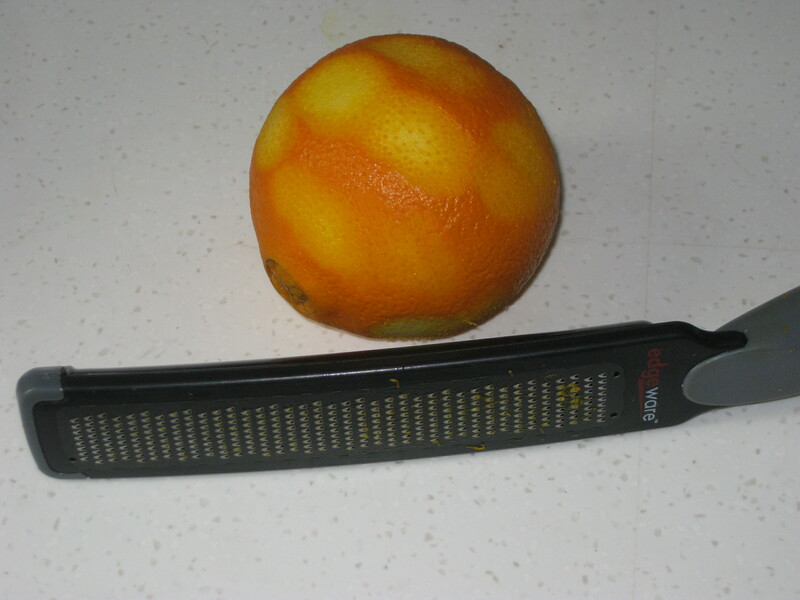 This was also my first chance to use the rather impressive zester I got for my birthday – it’s amazing! 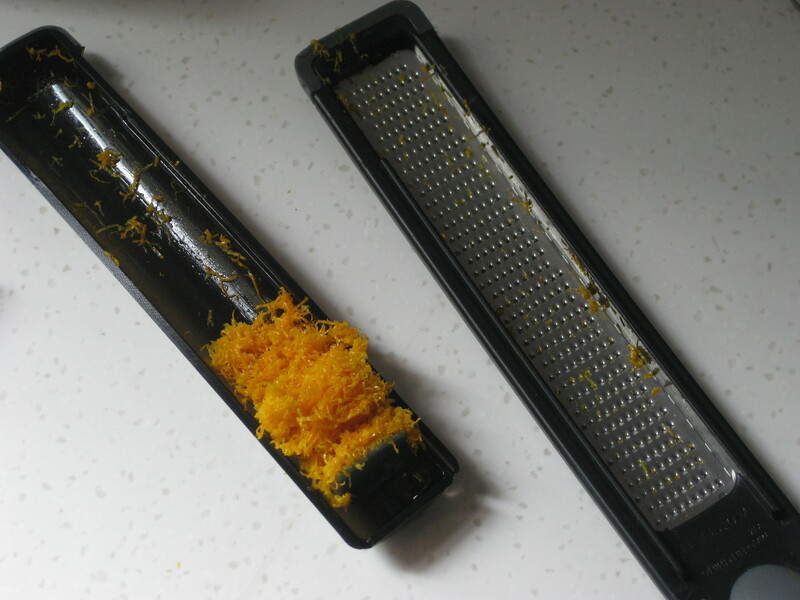 I’m now on a mission to do lots of baking with lemons, limes and oranges, purely so I can get more use out of it. 1. 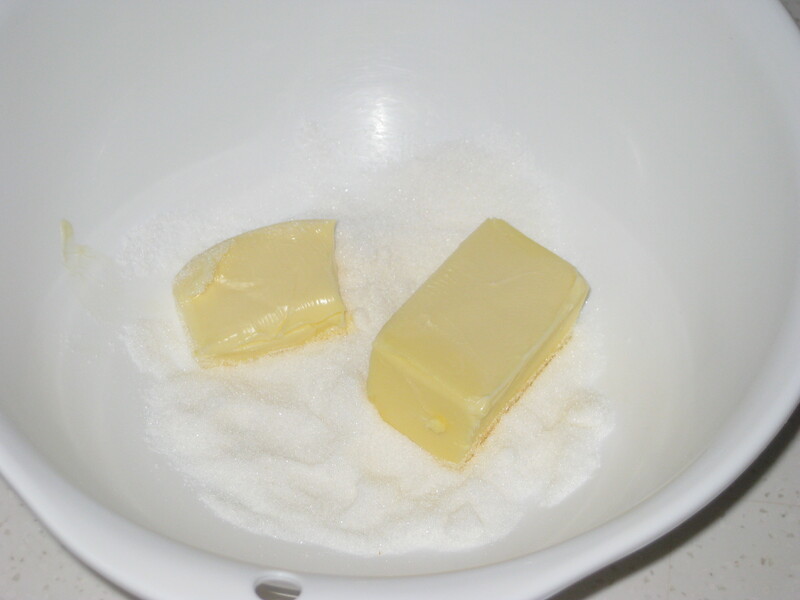 Cream the spread and sugar together in a bowl until pale and fluffy. 2. 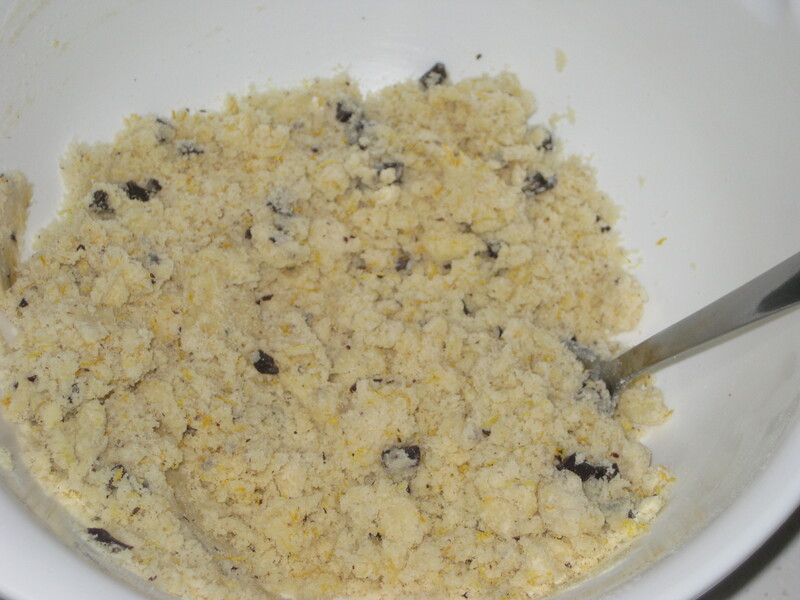 Sift the flour, rice flour and salt together onto the creamed mixture. 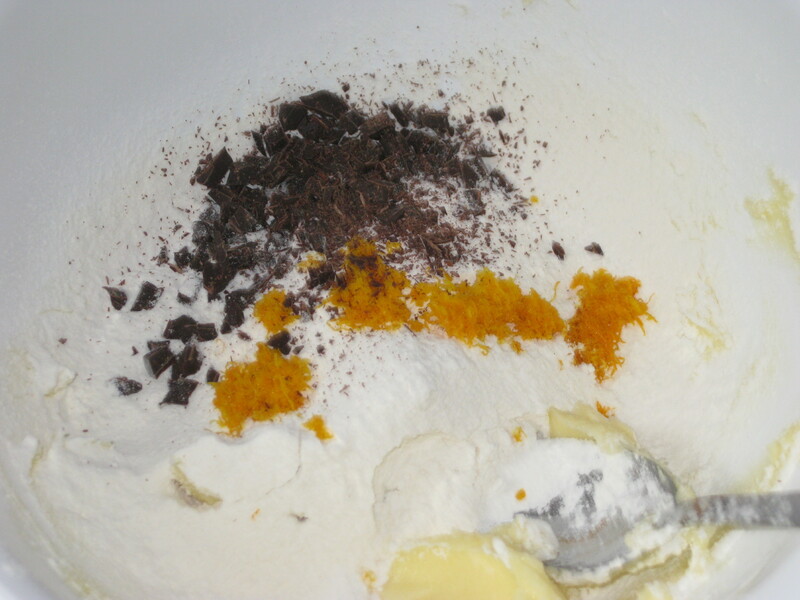 Add the orange zest and chocolate chips, and stir with a spoon until it resembles breadcrumbs. 3. 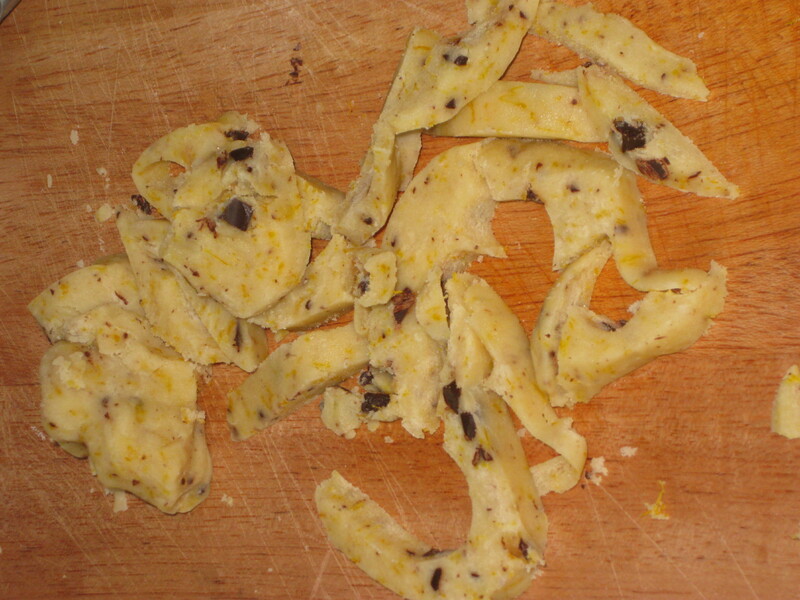 Gather the dough together with your hands and turn onto a clean work surface. 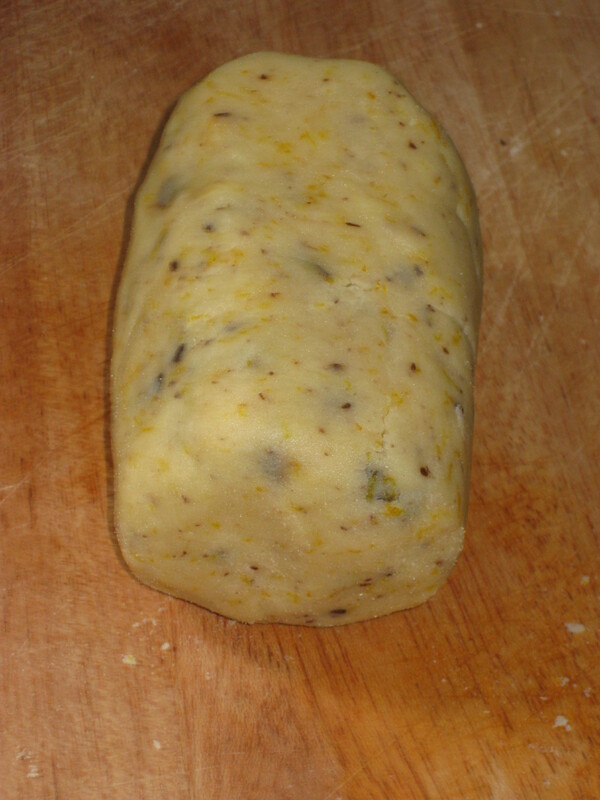 Knead lightly until it forms a ball, then lightly roll into a sausage about 5cm thick. 4. 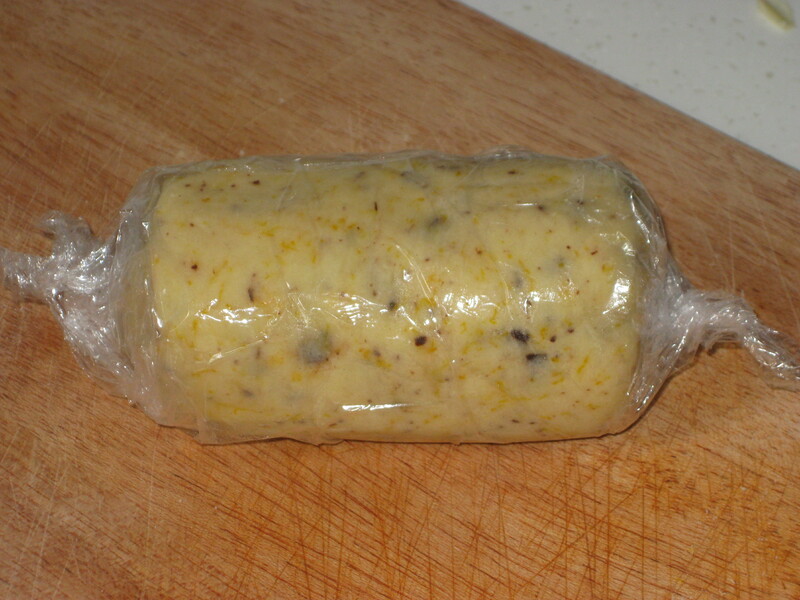 Wrap in clingfilm and chill in the fridge until firm. 5. 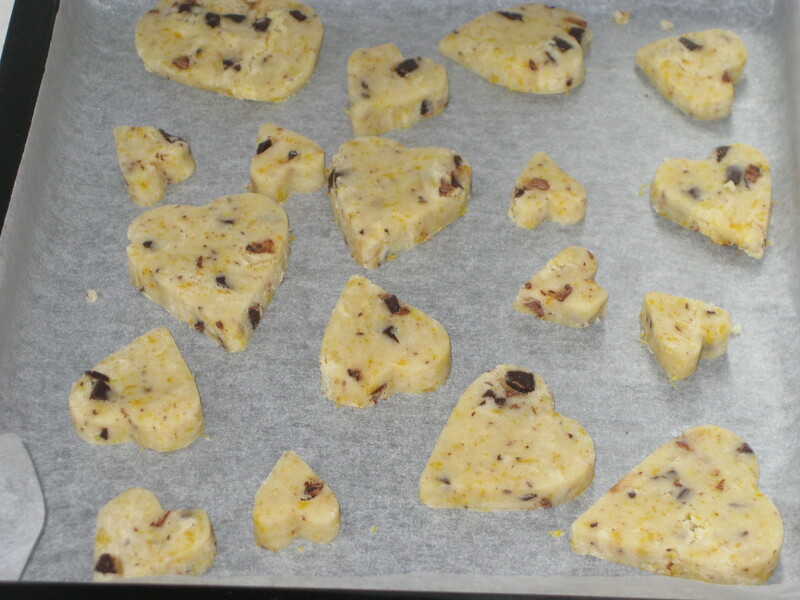 Preheat the oven to 190C and line a baking tray with greaseproof paper. Unwrap the roll and slice into discs about 7-10mm thick. Cut out heart shapes from the circles – I made a variety of different sizes. 6. Squidge the leftovers back into a sausage shape, slice up and cut out more hearts. Place on the baking tray. 7. Bake for 15-20 minutes, until pale golden. Sprinkle with a little extra caster sugar. Leave on the baking sheet for 10 minutes, then transfer to a wire rack to cool. 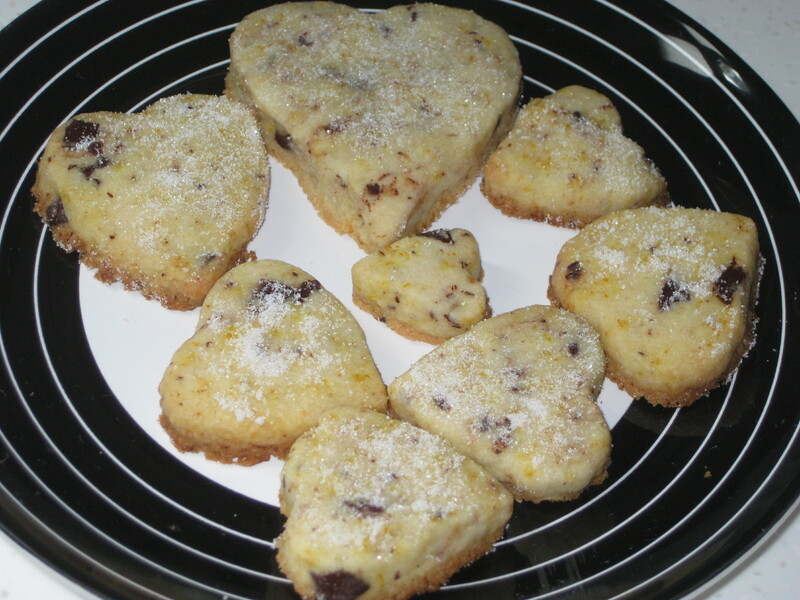 This entry was posted in Vegan Recipes and tagged chocolate organge shortbread, shortbread, special shortbread. Bookmark the permalink.